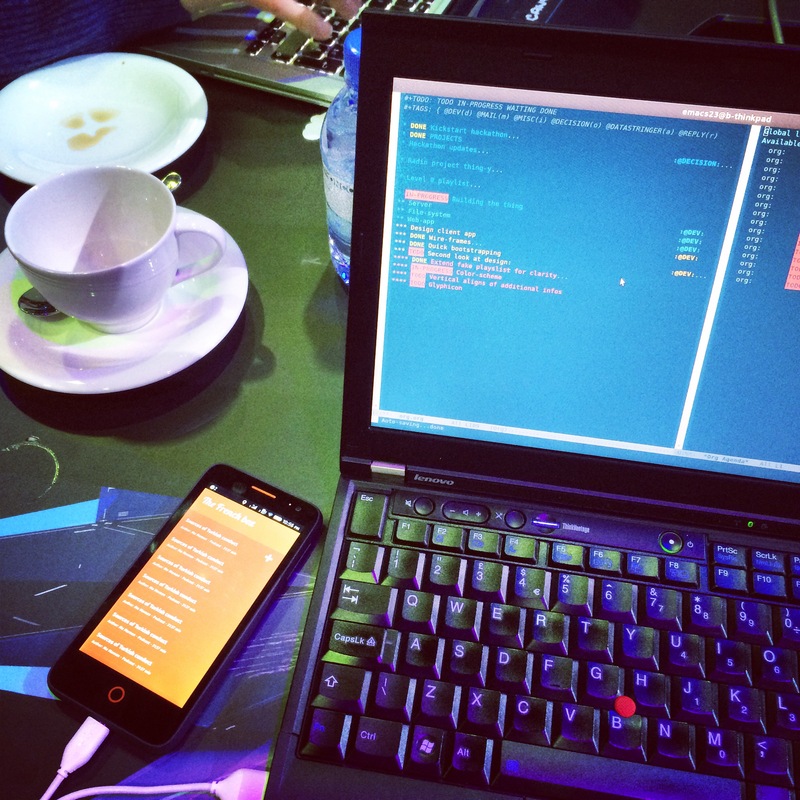 I originally wrote part of this post on my long flight back from Qatar, because I've got to share my excitement about what was, hands down, the best hackathon of my life. Al Jazeera put together this event to launch a new initiative, and went for the whole nine yards when it came to organise and take care of the 90 participants selected out of 1,600 applications. That would be with pleasure that I'd ramble about how great the trip, the venue, and the people, were, but I have a hunch that it would be unnecessary. So, instead of me talking about the empty streets of this unbelievably non-pedestrian-friendly city that's Qatar's capital, Doha, have a look at tinyfm, the project we worked on during the Media in Context event. My team was 100% French - but it was only partly a coincidence. You see, three people from the News Labs were invited to come hacking in Doha: Thomas Parisot, from BBC R&D, Melanie Moeller, part-time Visual Journalism and News Labs, and myself. We intended to work together but eventually splitted into different teams. Alexandre Vallette was the third member of this fine group of French whiners and wine-lovers in a place where getting hold of some booze proved to be extremely difficult. 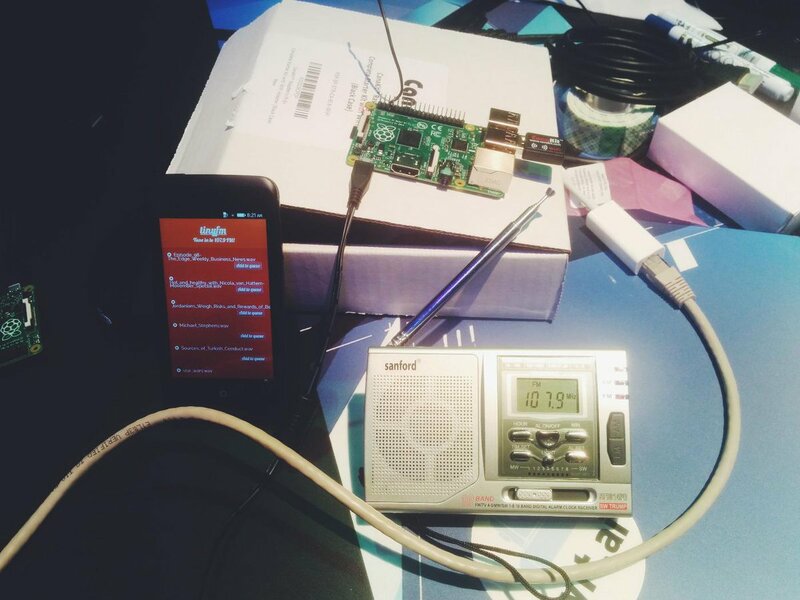 Inspired by the pirate radios, amateur radios, and French radios libres, we created tinyfm, a tiny solution to create local radios. We converted a Raspberry Pi into a radio transmitter - with a home-made antenna which, basically, was the wire holding the power cable together. Then we designed a back-end solution so the radio back-end on the Pi can interact with the web, through a web-app enabling other users to influence and participate in the playslit (or broadcasting running order, technically). Now, the hardest bit is easily to come back to London after only a handful of days in this very welcoming climate, with such talented people. But yeah, that's the occasion to flood my office with airwaves!